GetLinked® Software Forum • View topic - We are using Mymicros.net to import our point of sale and payroll datta into GetLinked. How do we get started? Post subject: We are using Mymicros.net to import our point of sale and payroll datta into GetLinked. How do we get started? When using the MyMicros interface GETLinked makes a direct connection to your MyMicros server to access the required data. There are no scripts or data files required. 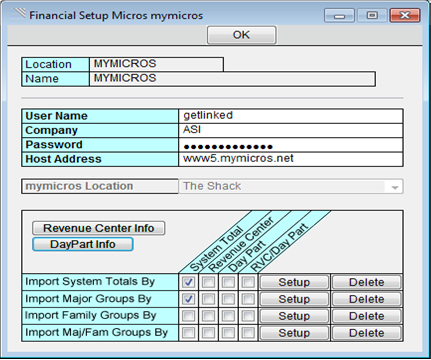 To setup the MyMicros interface in GetLinked Software you simply enter your MyMicros information (User Name, Company, Password, Host Addres) just like you would if you were logging into the MyMicros site itself. Once you have selected the appropriate location (ex. “The Shack”) you can select the level of detail needed using the grid of checkboxes at the bottom of the screen. Most customers only need “System Totals by System Total” and “Major Groups by System Total” as shown in the screenshot below. After you make your selections click the “Setup” button to the right of that section and GetLinked Software will build a list of item definitions. You can also use the “Revenue Center Info” and “DayPart Info” to test that your connection is setup correctly. If your connection is good each button will pop up a quick message with the list of Revenue Centers or Day Parts on your MyMicros system. Once you are done building item definitions you can click OK at the top of the screen and proceed to the Daily Summary window (Click POSLink > Daily Summary) to import transactions. NOTE: Micros "3700" and "MyMicros.net" methods of importing your point of sale data are different configurations from Micros and GetLinked Software has to follow their configurations. Therefore, the data in GetLinked Software is incompatible between the two methods. - The Micros 3700 sql script export method and the MyMicros direct interface create different (incompatible) definitions. - If you setup and assign account numbers using the Micros 3700 sql script method and then change to MyMicros (or visa versa) you’ll have to assign account numbers all over again. - Just something to keep in mind if you are switching back and forth between different import methods.